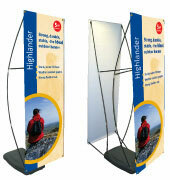 The Highlander is a single or double-sided outdoor banner stand with a base that can be filled with water. The pvc graphics are fully resistant to rain and UV. The Anchor has a base that can be filled with water. 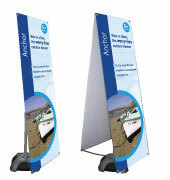 Easily attachable weather resistant graphics can be varied in size to suit the user’s requirements.